Basically, the gameplay of MapleStory Blitz is not much different than Clash Royle, the main arena is split into lane, players use their hero cards to be arrayed to attack or defend the main house. Players have the opportunity to dominate six formidable quests for valuable Ncoin rewards. Players can collect Original Card Packs (x1) for weekday afternoon logins, and a 1-Day Meso Booster for weekend morning logins for a limited time. Mercedes - A talented archer possessed of deadly arrows by the Fairy King. Phantom - The greatest thief in history, freed from prison after years of captivity for the purpose of revenge for the death of his beloved - Empress Aria. Kyrin - Beautiful pirate captain and notorious for his talent. Demon Slayer - Formerly the head of the Black Mage organization. 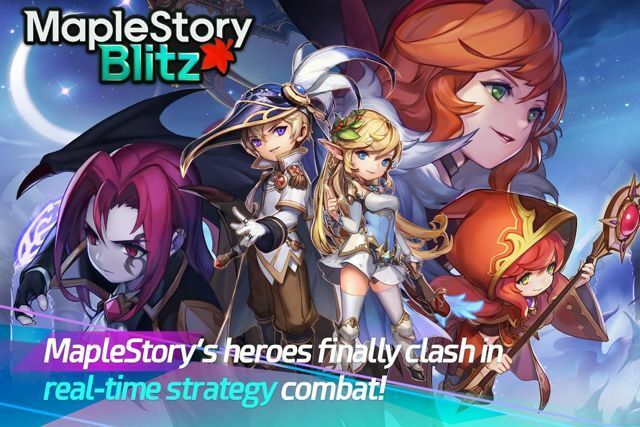 Experience the familiar characters of MapleStory in a whole new way and play, promising to bring the game's tough appeal, right now, players can download and experience right away. The game is available today in Australia, Malaysia, Norway, Denmark, Sweden, Finland, Poland, the Netherlands and the Philippines now.